The 1960 AL Rookie of the Year with Baltimore, Ron spent the 1970 and ’71 seasons with the Yankees as their primary utility infielder. 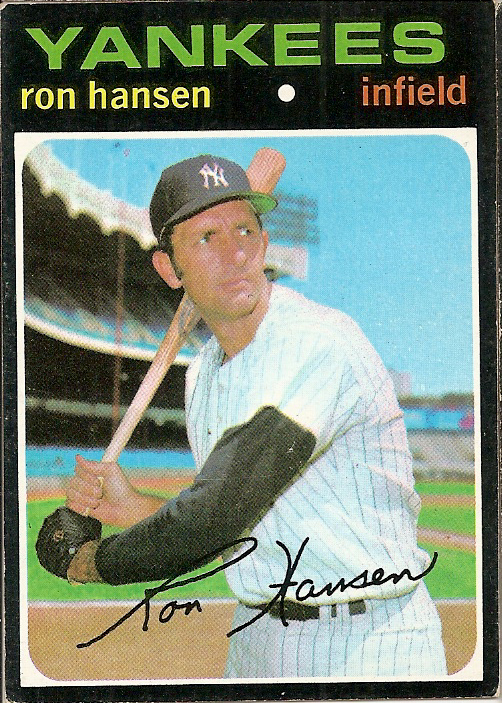 During his first season in pinstripes, Hansen was able to hit .297 in his part-time role but when he slumped to .207 the following season New York released him. In 1968, he became the first player to pull off an unassisted triple play since 1927 and the feat wasn’t accomplished again until 1994 (by Boston shortstop John Valentin.) In a very unique vote, when Hansen won his 1960 AL ROY award, two of his Orioles’ teammates finished second (pitcher Chuck Estrada) and third (first baseman Jim Gentile) in the balloting for the first year honor. Hansen shares his April 5th birthday with this former Yankee reliever and the first starting third baseman in Yankee franchise history.